Here I will present some quite thin galaxies with an axis ratio of at least 1:5. Nevertheless this value is calculated from the given angular size, so the visual impression can differ. The 13.07 mag star in the northern part of the galaxy I could easily see with averted vision. The galaxy stayed hidden. At 100x just a hint of a galaxy at the limit of perception. At 150x the galaxy appeared as faint, elongated, thin glow. North of the galaxy an apparent field star. SQM-L 20.5: Towards horizon the sky was unfortunately a bit hazy. At 108x the halo around the 9.43 mag star seemed to be a bit irregular, but I didn't saw the galaxy for sure. I also tried it at 50x and 75x. But I'm pretty sure, that the galaxy could be seen with this aperture under better conditions. Very thin, elongated, evenly bright. Very faint and not permanently seen with averted vision. Elongated, thin, tapering endings, rather evenly bright. Rather well seen with averted vision. Very elongated, evenly bright, getting a bit wider toward the middle with tapering endings. Thin, very elongated, somewhat brighter and broader toward the center, otherwise rather evenly bright. Fairly well seen with averted vision. Only the brighter core area was visible as rather faint, elongated brightening. At 18x rather faint, very elongated with tapering ends. At 40x similar view but overall more obvious. The dust lane was not visible. At 18x more or less obvious with averted vision, elongated, evenly bright. At 75x the dust lane is perceptible to some extent with averted vision, but not clearly & permanently visible. At 34x evident with averted vision, evenly bright, very elongated with tapering endings. At 72x and 100x the dust lane is well visible with averted vision. With averted vision very elongated, evenly bright, tapering ends, slight broadening toward the middle. Overall pretty faint and anything but conspicuous. SQM-L 20.5: Towards horizon the sky was unfortunately a bit hazy. Difficult to held. Just a very faint, elongated, thin glow. NELM 5.1+: Despite great effort nothing seen. Very elongated, thin, evenly bright. Well visible with averted vision. Already visible at 23x with averted vision. At 48x very evident with averted vision, obviously elongated, tapering endings, thin, getting slightly brighter towards the middle. Slightly elongated, getting a bit brighter toward the middle. Fairly well seen with averted vision. 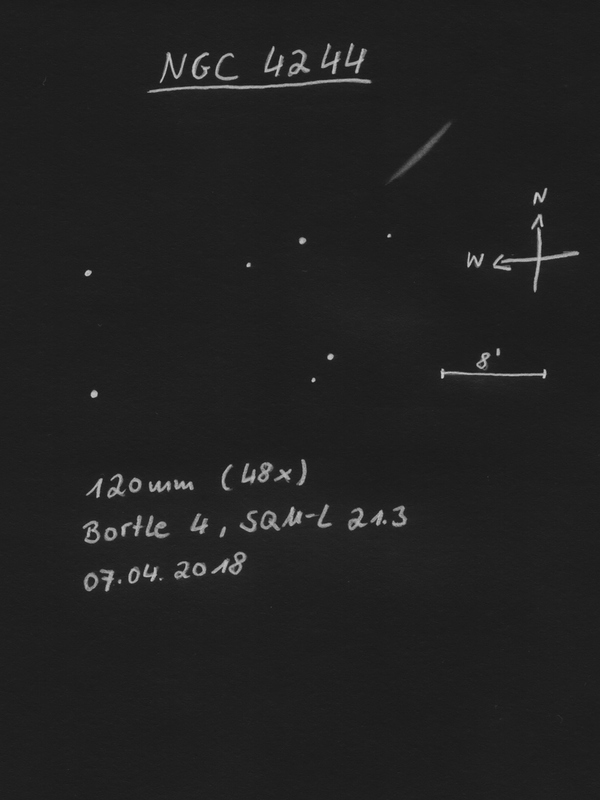 SQM-L 20.9: Slightly elongated, rather faint brightening. At 60x thin, very elongated, evenly bright. Also visible at 28x as faint brightening. At 28x rather faint, thin, getting brighter & broader toward the middle. At 60x evident with averted vision. The observation with the 4.5 inch Newtonian was made about three years later than with the 8 inch Dobsonian. This impressively shows the impact of experience of an observer. Quite thin, elongated, evenly bright. Fairly well seen with averted vision. I tried this galaxy serveral times but often without success! Only one time I glimpsed this extremely faint galaxy as thin, elongated brightening. This is a real challenge for 8 inch! Glimpsed with averted vision as very faint, very elongated nebula. Worthwile! Together with UGC3446 an enexpectedly bright pair of galaxies. Both galaxies fairly easily seen with 8 inch, even under a suburban sky. Roundish, diffuse. Slightly brighter than UGC3446. Fairly easily held with averted vision. Quite small, faint, diffuse, roundish brightening. Appeared a bit brighter than UGC3446.